There's no question about it. Inflatables draw crowds. But when it comes to generating new and creative ideas for the use of your event advertising balloons, it's always best to have a little help. 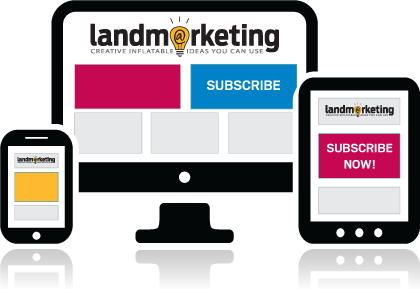 Landmarketing is a quarterly ezine published by Landmark Creations that delivers insightful articles on the use, care and maintenance of commercial advertising inflatables. You'll also find numerous case studies so you can learn from the successes of others. From marketing to maintenance, each issue of Landmarketing provides insightful information designed to improve the overall performance and ROI of your event advertising balloons. Feel free to browse the most recent issues. Want Creative Ideas for Using Custom Inflatables Delivered to Your Inbox Every 3 Months? Subscribe! Summer's in full swing and that means automotive, home and other trade shows are in practically every town. Which inflatables will get you seen even in the thickest crowds? Product Replicas - There's something wonderfully curious about exact replicas of products we use every day that have been supersized. Inflatable Logos - Promote your brand in a truly unique way with inflatable logos. Inflatable Kiosks - Give away samples; serve food or beverages; sign people up for services. Multifunctional and oh-so-noticeable, inflatable kiosks are great for any show where being interactive is a must. 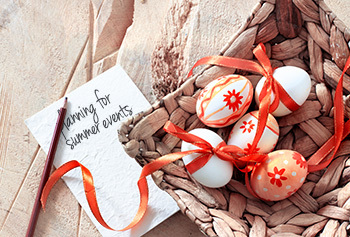 Are you gearing up for end-of-summer holiday promotions? Whether it's retail events or a corporate party, inflatables get you seen while adding to all the fun. For those who are in retail, now is crunch time. As you put the finishing touches on your Holiday 2009 campaigns, you'll want to take every opportunity to draw customers into your stores. Inflatables are one of the most attention-grabbing, captivating marketing tools available. And, because they are sturdy and reusable season after season, they deliver great value for your investment. Oh, what changes are in store for 2009! This will most certainly be a year for the history books. Our first African-American president will take office. Our country will start its economic recovery. And many marketers, perhaps for the first time, will purchase new inflatables. In these days of uncertainty, marketers are drawn like flies to what works. That's one thing that makes inflatable advertising balloons so attractive. Who especially needs to be thinking inflatables right now? The article and case studies included in this issue of Landmarketing will help you put your inflatables to good use. As always, if you have questions, need ideas or want a quote, we're just a click away! Performance. Speed. Freedom. Harley riders are known for their love of the open road. They also have a reputation as being fanatical about their bikes. DG Arquitectura, an interior design firm in the Dominican Republic, had a twofold purpose when they contacted Landmark Creations. They wanted to add beautiful, bigger-than-life Christmas decorations to the Acropolis Center (a local mall) in Santo Domingo to increase holiday cheer. They also wanted to generate some additional marketing revenue. In 1948, Affy Tapple, in the big city of Chicago, created the very first caramel apple in the United States. For the next 60 years, it has continued to grow by offering a fun and delicious way to raise funds for charities, schools and more. So, when Affy Tapple decided to branch out with its promotional and event marketing efforts, it needed a bit of expert help. Enter Landmark Creations. A recognized leader in vehicle wash systems, PDQ Manufacturing needed a way to keep foot traffic from getting washed downstream at their tradeshow booth. As you know, exhibiting at shows often means fighting a fierce battle for floor space. Position is everything! End up buried in the wrong part of the hall and you'll see little action. That's why PDQ asked for Landmark's help with creating a tradeshow display that would attract attention and stop passersby. Ever wonder how in the world we get those great big inflatables into those tiny little carrying bags? It's a closely guarded secret, but we're willing to share. Make deflating and packing your inflatable easy... watch this quick video to see how the pros do it. Archways - Perfect for warmer weather activities including marathons, triathlons, bicycle races, outdoor events, festivals and more. Costumes - Bring your mascot to life with a lightweight, cool inflatable costume. Sports Tunnels - If football and other sports are your bag, now's the time to plan and order your inflatable sports tunnel. We'll need to have your project in the works no later than June to guarantee delivery by fall. Summer's in full swing and you know what that means. Kids are out of school. Families head out on vacation. And, Landmark Creations is gearing up for fall. Yes, you read that right… fall. We don't just have tons of fun around here; we also think ahead. If you're planning Halloween, Thanksgiving or other fall events, upcoming product launches or grand openings, now's the time to place your order. Football season is fast approaching. Schools and booster clubs should aim for placing inflatable football helmet and sports tunnel orders within the next few weeks. - Attending the Event Solutions Idea Factory on February 22–26. When Bushnell decided to take a stand as the world leader in outdoor technologies, it set out on the road during a massive nationwide mobile marketing campaign. For months on end, Michael Waddell, host of the TV show Real Road Trips, has zigzagged across the country making stops at popular retailers such as Cabela's, Bass Pro Shops and others. Where do inflatables come in? New York City is world famous for having some of the most unusual sights and people in the world. So it took a little doing to create something that would capture attention in this borough of the bizarre. A giant, red, inflatable product replica did the trick! What says "beep beep" and runs circles around other forms of mobile marketing? The Road Runner, of course! How do we know? Time Warner Cable has the pictures to prove it. They took their inflatable mascot on the road during their mobile marketing tour to build awareness and drum up new customers for their Road Runner high-speed cable service. First stop… Erie County Fair. Cheerleaders are great! And bands are very entertaining, but if you really want to hear the fans scream, bring out an inflatable rattlesnake. The students, fans and faculty have all been wildly excited about their new custom inflatable sports tunnel. Ashley Furniture Wellness Center "Big Guy"
When Ashley Furniture called and requested we make a smiley-faced doctor for their grand opening, we were a little confused. A doctor for a furniture store? Once they explained, it all made sense. Otis the dog accompanies his owner, the President of Northern State Bank of Virginia, to work every day faithfully. He's become quite a fixture and is considered one of the team. In fact, Otis is so well loved, he's moved into the position of official bank mascot. Because the public loves him so, his presence is often requested at community events. But for such a small creature, crowds are not always a good thing. Enter Otis the inflatable mascot. Buzz. First introduced as a - well - "buzzword" in about 1998, it faded from the marketing vocabulary a few years later. However, with the explosion of Web 2.0 in recent years, the catchphrase is back in full force. What better way to describe the phenomenon of everyone chattering about your new product than "buzz”? Sometimes Politicians Say the Dumbest Things! Whether it's McCain flubbing the names of the Shiites and Sunnis or Obama saying he doesn't take special interest money then taking it; this historic election between experience and change is bound to get down and dirty before it's over. When you feel the tension building, we've got a fun-loving solution. Positioning your products and services as the perfect solution for clients is more important this holiday season than ever. Inflatables of all types give you a leg up in all your marketing efforts, so you can pull a better response than with traditional marketing techniques alone. What happens when you place a giant Komodo dragon on a rooftop, invite people to walk through the human colon and enlist a monkey to peddle pizza? You gain a lot of attention and business! You'll find these and other idea-generating case studies in this issue of Landmarketing, plus a thought-provoking reminder about the importance of excellent customer service. Warm weather lends itself perfectly to a more active lifestyle. This holds true for people as well as inflatables. As the temps rise, we break out our grills, our bicycles and more that have been packed safely away during the winter. It's also the ideal time to dust off your inflatables and get them set for a busy, outdoor marketing season. In case any of your promotions entail rooftop installations, we're offering a detailed look at the process from start to finish. You'll be strapped down, blown up and ready to sell in no time. When you think "inflatables" the first things that typically come to mind are product replicas, tents and sports tunnels. However, at Landmark Creations we recently used our capability to produce digitally printed artwork to craft a distinctive inflatable globe. Not the usual 360-degree round version, but a backlit unique inflatable with one flat side that was hoisted to the ceiling. Thanks to the University of Wisconsin's Wisconsin Alumni Association (WAA), the school now has a new inflatable mascot that's been turning heads all over campus. With student organizations, the homecoming committee, the alumni association and the athletic department clamoring for the Bucky character inflatable to make an appearance at their events, this 20-foot-tall tough guy has really been getting around. Anthony Valenzano had a problem. "We wanted to be noticed as a prominent winery among 25 competitors. We needed visible signage that stood out and made a grand impression. These events are always on open fields so wind has always been an issue with signage making many banners and stands not practical." What's a winery to do when they need to stand out in a crowd and be noticed? Of course, this is a perfect application for giant advertising balloon. Over the course of several months, Suzuki car dealer, Pete Sanchez, and his young artist friend developed the concept for a mascot they could use in several ways. The reality of their efforts was Mando the tiger. He started out as a costume and then moved into a caricature that stands in front of the children's play area at Katy Mills Mall (the most visited area of the mall since its grand opening in may of 07). But Mando didn't stop there. Next he was transformed (with the help of Landmark Creations) into an inflatable mascot that towered 20 feet high. Rooftop installations of cold-air inflatables are not something to be taken lightly. They are not the same as helium rooftop installations or ground installations. Because of the sheer height involved and the special considerations a rooftop installation entails, you'll need to be extra cautious. This article will outline the necessary steps for rooftop installations. However, if you own an inflatable or are thinking of buying one, I strongly suggest you hire a professional to conduct at least your first install.